We get books returned to us on occasion because the customer is dissatisfied with some or other aspect of the quality of the book. Often times these problems are simple misunderstandings. I'm going to try and explain some of the most simple issues in the next few blogs, starting this week with the print area. I'm sure you've noticed on your home inkjet printer that the print can't go all the way over the edge of the page. while some fancy home printers have recently added boarderless printing, the majority can't achieve this, and it's the same with our large printing presses, there is an area around the edge of the page where the printer actually grips the paper in order to move it through the press, this area can't be printed on, therefore the images of your photobook pages are printed on a larger sheet, and then cut down to size in order to achieve a neat uniform block of borderless prints that will become the pages of your book. I'm sure too, if you've ever done some crafts, that it's extremely difficult to cut precisely on the edge of an image. it's always better to either cut the image with a small white border, or cut off a small margin of the image in order to have a boarderless print. 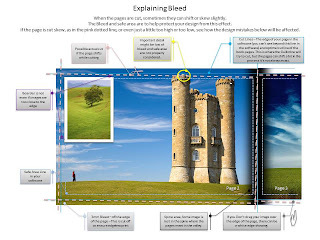 In print, we call this small margin that is cut off "Bleed" - it's 3mm of print area that is cut off of the printed image in order to achieve a boarderless page. Why 3mm you ask? In a block of shiny slippery UV varnished pages, 3mm is a safe margin of cut error, so if any of the pages in the block move slightly during cutting no white border shows. It's obviously very important not to have any important detail in this bleed area as it'll definitely be cut off the page. Now, if I cut 3mm out on the right hand side of the page, this means that I'm going to cut 3mm extra in on the left. to demonstrate this dangerous area that could inadvertently become bleed we use a "safe area" drawn on the screen page with a dotted line. In this image you can see the edge of the page, with the dotted safe area line just inside that. Your bleed area is OUTSIDE the edge of the page. If you want your images to bleed off the page of your book you should drag them beyond the edge of the page area so that they can bleed even if the cut isn't exactly where it's expected. The page on the left will bleed off while the page on the right will have a white border. In the image below i've outlined the image areas in red to demonstrate bleed and the optimal way of positioning images. Both if you want a border or if you want the images to bleed. Please note that it is very very likely that the top of the orange will be cut off when the book block is cut. The black line is the edge of the page while the dotted line is the safe area line. It's also important to know that in non-lay flat books (like our hard covers and square backs) the print in the spine of the book will also need to bleed - so some image area is lost. Please don't put important image detail outside the safe area of the spine. On the cover of hardcover books you will see that the safe area is quite large. This is to accommodate the area of the print that needs to wrap around to the inside of the cover. It's important to keep important cover detail well within the safe area. NB! If you're working on Mac (iPhoto), bleed is not sent trough in your PDF file so assume that 3mm inside your page will be bleed, and only 3mm inside that area will be "safe" - so that's a full 6mm from the edge of the page where the safe area starts.